SES's Help Desk Software is a web based system that can be hosted on premise (on your servers) or in the cloud. Our Help Desk Control offers a comprehensive help desk solution designed to streamline common workflow processes, while providing added visibility through the self-service portal. By focusing on core ticketing functionally, HDC provides a highly effective help desk solution without adding the complexity and overhead of asset management. The result is a nimble, cost-effective solution for help desk operations. Directly from the Help Desk module, Staff can search to build a queue of the tickets they want to work in. From that queue they can sort by record number, subject, status, opened by, assignee, category, priority, date open and date scheduled. The queue also shows if the ticket has attachments or if someone else happens to be editing it at that moment. HELP DESK QUEUE - Click for more detail. 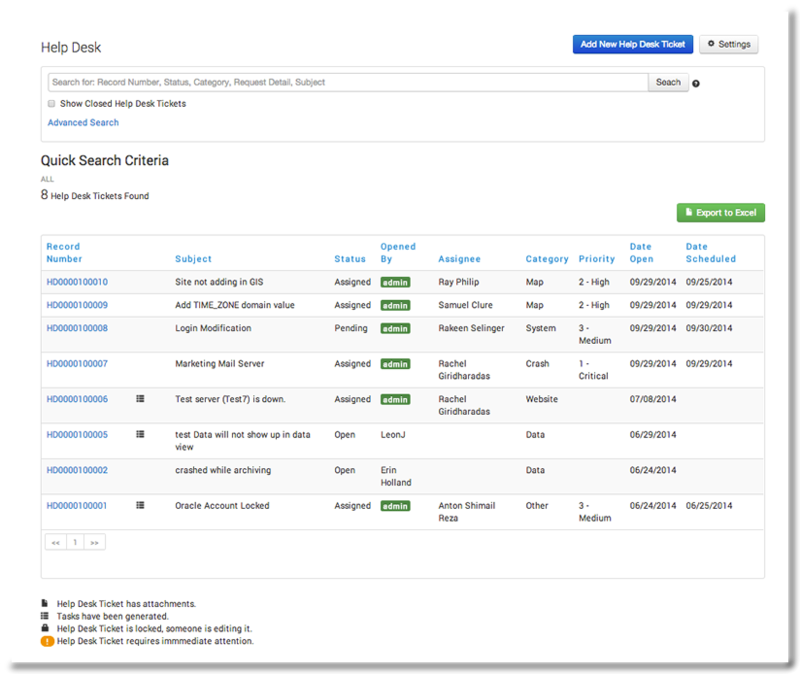 THE HELP DESK DASHBOARD - Click Image for more detail. Upon logging into the system both Staff and Users will be presented with a dashboard showing what Help Desk issues need to be worked on immediately. Staff can drill down into the active Help Desk issues, broken down by Status, Category and Priority. They can also use a Category Filter to focus on specific areas. If a user enters a Help Desk issue on their own, an email notification will immediately be sent to any number of people you choose. Once a ticket is assigned to staff, they will see it in their dashboard and receive email notifications to make sure the ticket doesn’t “fall through the cracks”. SES’s Help Desk software lets you set up email rules based on the field you want. For instance, tickets with a Category of “marketing” and a status of “open” should be sent to Joe Smith. The data contained in those emails can be comprised of any field in the system formatted however you wish with the ability to add a link in the email to take the staff of user directly into that ticket. Moreover, emails “on the fly” can be sent directly from the ticket itself. CREATE AN EMAIL RULE - Click image for more detail. SENT EMAIL NOTIFICATION - Click image for more detail. CREATE YOUR OWN LOOK AND FEEL - Click image for more detail. All SES software stands far above the rest when it comes to customizing the system. From a branding standpoint, our customers can add their own logos, background images and color schemes. Beyond this, the software is extremely powerful with a user friendly form editor and field editor. All end users in the system have their own login (we support Active Directory integration as well) to access the system. From there, they can submit new tickets, check the status of existing tickets, use the Knowledge Base and FAQ tools for self service and change their password. Customers (users) also always are able to receive email notifications related to the tickets they have submitted. Even if they phone in a ticket, they are able to see its progress from their own help desk portal. CUSTOMER DASHBOARD - Click image for more detail. CUSTOMER TICKET SUBMIT - Click image for more detail. Try a full featured demo version of SES's Help Desk Software free for 30 days. Experience our excellent customer service and support as we work to make the system a perfect fit for your environment.